Siblings squabble all the time. Sibling rivalry goes hand in hand with sibling love and, for parents, can be extremely wearing and confusing. This book tells the story from both sides and demonstrates strategies that families can use to turn sibling squabbles into healthy sibling negotiations. This story is about a brother and sister whose every day niggles and rows, typical of those between brothers and sisters, eventually drive their friends and mum mad. It all comes to a head and they have to find another way of sorting out their differences. At the end of the story they are happier, and so is their mum! 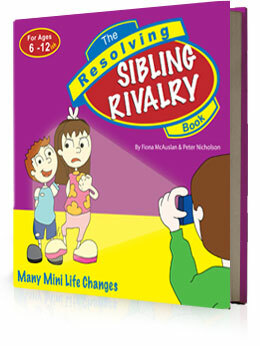 The Resolving Sibling Rivalry book is a 88 page full colour, easy to read and understand tool that can be enjoyed by a child on their own or read as part of a group or with a parent or teacher. You can buy these books online or simply download the order form and fill it in. You may need to install Adobe Reader to view the downloadable files. You can purchase these books at all Veritas stores as well as many other book store outlets.